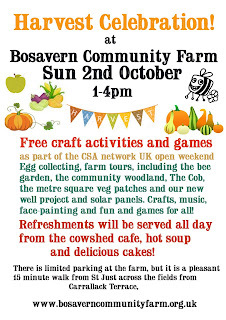 Just to remind you that this Sunday 2nd October from 1 till 4pm we will be holding our annual harvest celebration on the farm, and everybody is welcome to come along and join in. 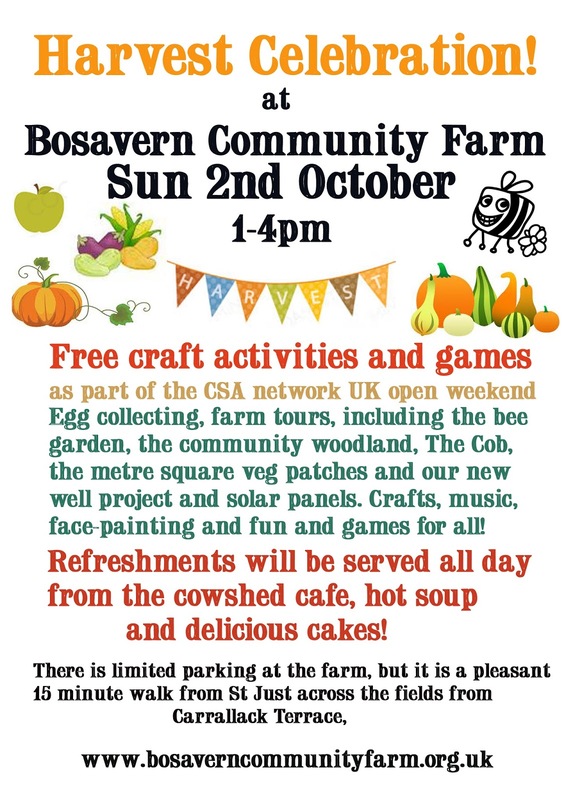 There will be a pop-up cafe in the farmyard, craft workshops, a farm tour, a chance to meet some of the farm team, and fresh produce for sale, amongst other things. Don't miss it! Magdalena, from Germany, left the farm this morning to travel on to her next WWOOF placement, having volunteered with us for 7 weeks over the summer. Maggi has been invaluable on the farm and we miss her already! Maggi picking mizuna for salad bags one Friday morning. These two unusual views of Bosavern Community Farm were taken on Sunday from the hills behind the farm, and clearly show the polytunnels, chicken sheds, farm buildings, and some of the grazing and crop fields, as well as our proximity to the Cornish coastline. Our old shop sign was looking somewhat dilapidated, so we've built a new one using reclaimed timber from our woodshed. Our smart new sign stands by the roadside directing people to our farm shop, where you can buy lovely fresh produce such as the peppers shown above. Dario, Clara, Franziska and Lea. Four of our team of WWOOF volunteers have left the farm this week, either to return home or to continue their wwoofing experiences elsewhere, after volunteering with us for several weeks each. We'd like to thank them for their help and hard work during August and September. Dario, from Rome, picking salad early last Friday morning. Lea, from Berlin, also picking salad. Franziska (centre), from Germany, helping to harvest red onions last Saturday. Sorry Clara, I failed to get a photo of you! Small (£6) veg box - mixed salad leaves, onions, Picasso potatoes, peppers, courgette(s) and runner beans. Standard (£10) box also contained Swiss chard, beetroot, and extra runner beans. Please contact us at vegbox.bcf@bcents.org.uk to order your box, or phone 788454. Last Friday's £6 veg box contained Picasso pink-eyed potatoes, mixed peppers, a cucumber, mixed courgettes, 2 red chillies, runner beans, and a bag of salad leaves. The £10 veg box contained all the above plus a punnet of cape gooseberries, kale, and fresh basil leaves. Today's £6 veg box - 500g bunched beetroot, 500g courgette(s), 100g mixed salad leaves, 1kg Picasso pink-eyed potatoes, 400g mixed tomatoes, 200g runner beans, and a sprig of fresh bay leaves. Today's standard £10 box contained - 1kg Picasso potatoes, 200g French beans, 500g beetroot, 2 peppers, 200g runner beans, a bulb fennel, a sprig of fresh bay leaves, a cabbage, 200g rainbow chard, 500g courgette(s), and 100g mixed salad leaves. We'd like to thank Mattia, from Italy, for his help wwoofing on the farm for two weeks, and wish him all the best in his onward journey. Mattia learning how to work in the farm shop, being taught by our regular Friday shop volunteer Mark.